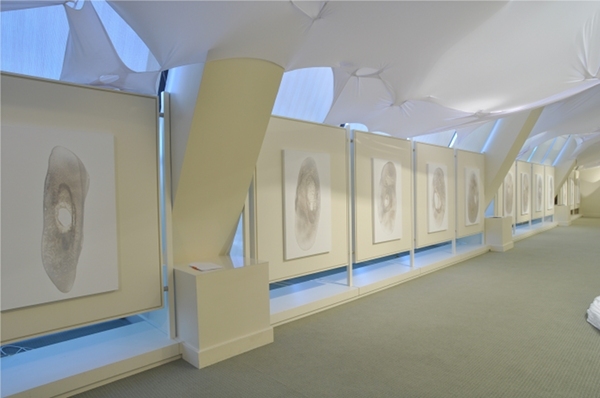 A week ago I saw the exhibition 0-Viewpoint by Stella Zhang at the Chinese Culture Center here in San Francisco. 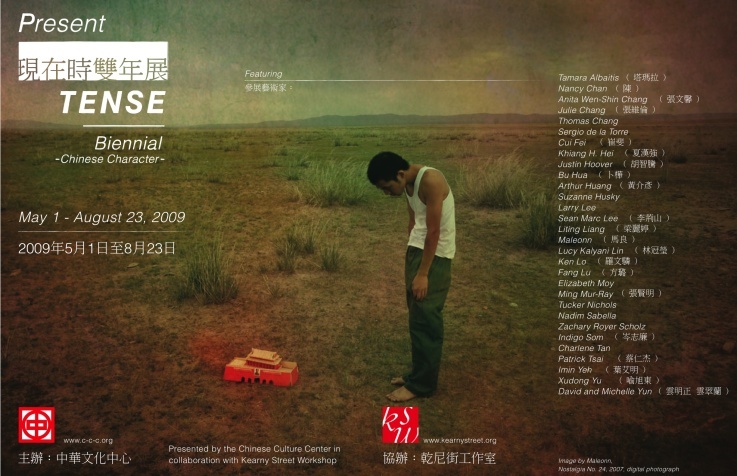 Zhang is the 2010 featured artist in the CCC’s Xian Rui (”Fresh & Sharp”) series, which showcases “the work of an incredibly talented but under-represented Chinese artist in America.” This year’s exhibition also had a goal of pushing the boundaries of what is considered “Chinese art” and challenging more traditional viewers’ expectations. 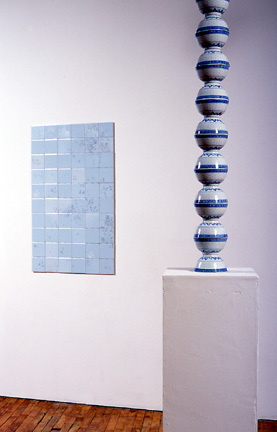 Zhang was schooled in classical Chinese art techniques, but the contemporary mixed-media installation eschews cultural tradition (except perhaps in some more subtle ways) and challenges the expectations many viewers might have of art and an artist identified as “Chinese.”. 0-viewpoint is also a deeply personal exhibition, in which Zhang “explores the constantly shifting inner landscapes of self and femininity.” Similar to heritage, gender comes with expectations. Confronting traditional expectations of both gender and heritage are topics of personal interest to me, which makes this an appealing exhibition to both see and reflect upon. The main corridor is covered by a long undulating white canvas, which sets the overall tone for the entire installation: curving forms of white fabric. Indeed, the gallery and all the pieces were almost entirely white. 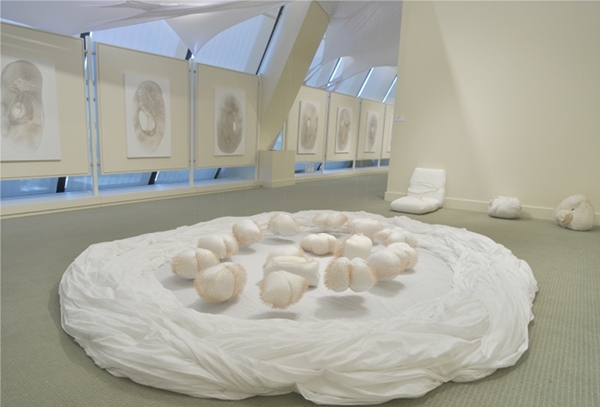 The white seemed to cast a silence over everything, which is both simultaneously meditative and a bit “anxious”. Although the color was uniform, the textures and shapes were quite complex, and in a way the use of white helps focus one on these dimensions instead of on color. It also made it possible to detach from the question of challenging tradition and allow it to fade into the background while focusing on the pieces themselves. 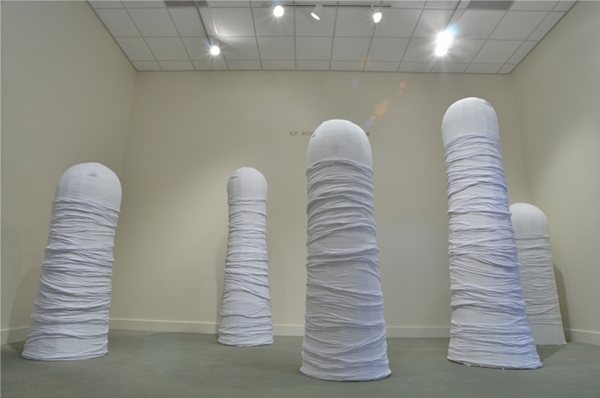 The installation in the first room is a collection of tall rather phallic sculptures. They were slightly higher than human size, and one could walk amongst the irregular arrangement of columns. The irregular shapes suggested something organic, like a forest or sea creatures. 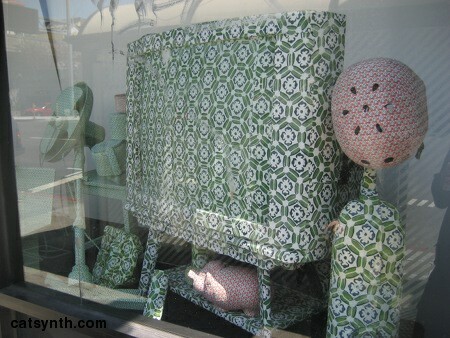 But the metal structure underneath the cloth also gave them an architectural feel. Towards the end of the gallery, the long canvas that covers the corridor descends to the floor and then comes back on the floor ending in a somewhat mysterious hole big enough to crawl through. Nearby, a video was projected onto the ground showing an image of swirling smoke or vapor with ethereal dreamlike music. The music was mostly in a minor mode, but with slightly unsettling tones in the middle section. Arranged along the corridor were a series of twelve panels suggesting the twelve signs of the zodiac (one of the few overt nods to Chinese tradition). Each of the white panels had a shape made of sand. Although the material was different the shapes seemed related to other parts of the installation: round curving but somewhat elongated with irregular holes. Stella Zhang, 0-Viewpoint from Jim Choi on Vimeo. It was interesting to see the physical process that goes into making the work, welding metal frames, gluing fabric and manually inserting the skewers into cloth. 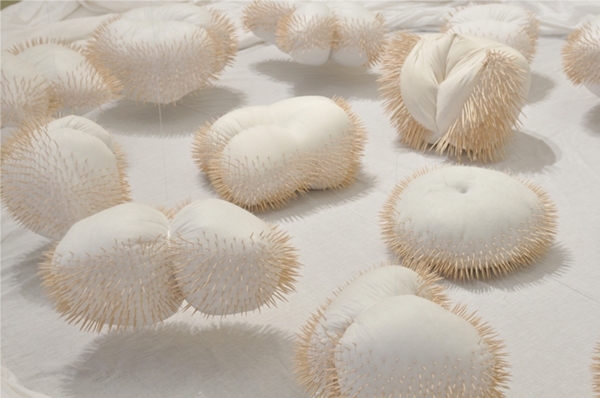 The full documentary also explores the tensions of the work, such as there was between Zhang and curator Abby Chen around the piece with the suspended cushions and wooden skewers. There was also a phrase that Zhang applied to herself, “trapped in a box”, that a viewer in the video later ascribed to Chinese art and culture as a whole. This phrase intrigued me, but there wasn’t a chance to follow up further. 0-Viewpoint will be on display at the Chinese Culture Center through September 5. In August I had the opportunity to take a private curator-led tour of the Present Tense Biennial exhibition at the Chinese Culture Center here in San Francisco before it closed on August 23. 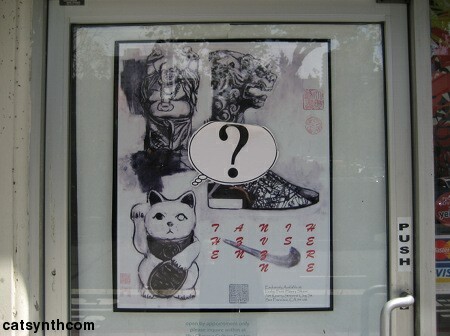 The exhibition was a joint project of the Chinese Cultural Center and the Kearny Street Workshop and included 31 artists with works that interpreted contemporary Chinese culture. There was no single direction or theme to these interpretations. There were plays on Chinese language, heritage, stereotypes, geography, artistic techniques, history and iconic objects. The above image, featured on the posters for the exhibition, is a photograph entitled Nostalgia No. 24 by Chinese artist Maleonn. It features a young man looking at a miniature model of the Tiananmen Gate in Beijing. In keeping with the exhibition title of “Chinese Character”, several works dealt with plays on language. 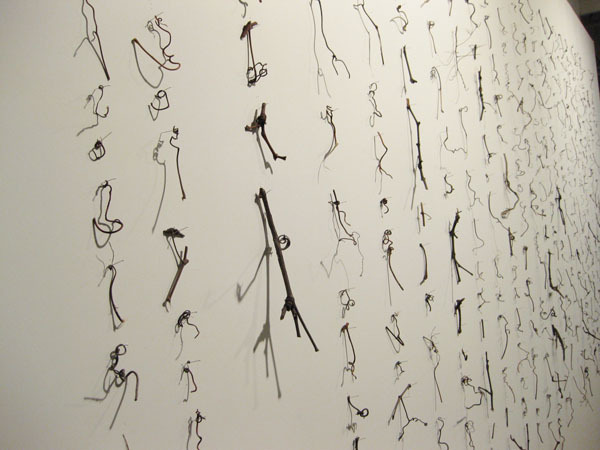 For example, the New-York-based artist Cui Fei’s Manuscript of Nature V was a large wall installation composed of plant tendrils resembling Chinese calligraphy. It was immediately reminiscent of handwritten Chinese characters (as I had seen many times in my recent visits); however, this was an entirely made-up character set. Tamara Albaitis presented an audio and sculptural installation, with two planar arrays of speakers. Each speaker played a human voice uttering sounds (not strictly phonemes, but vowels, consonants, diphthongs, etc.) from various languages. On one side were sounds from languages arranged strictly horizontally (e.g., English and other Indo-European languages) while on the other were languages that could be written vertically, such as several East Asian languages. One could walk through the middle of the installation, with each bank as a “wall” of linguistic sounds, or around the outside. Out of context, it was not easy to distinguish the sounds from one language or another. One could use directional cues to determine whether a language was “horizontal” or “vertical”, but that served more to demonstrate similarities or “confusion” among languages. In addition to the plays on language, these pieces were in the minority that I would consider to be “modern art” (rather than more loosely defined “contemporary art”). Another was Larry Lee’s Endless column takes a simple and familiar object, the traditional porcelain rice bowl,and arranges them in an “endless column” of spheres that extend from the base to the ceiling of the gallery. From a distance, it appears as a large piece of modernist abstract art, and the rice bowls are purely there for their shape and texture, rather than their function. However, the detail and functional context of the bowls are an interesting contrast to some of Lee’s other abstract sculptures (some of which can be seen at the CCC online gallery) with the simple geometry and solid colors that are the norm for abstract art. Among my favorite photographs in the exhibition were Thomas Chang’s images of a Chinese-government-sponsored project in the United States that did not go so well. Spendid China was a theme park in Orlando, Florida (where else could it be?) that featured to-scale models of great Chinese monuments, including the Great Wall and others. The park closed in 2003, after which it became a frequent target of vandalism and fell into disrepair. 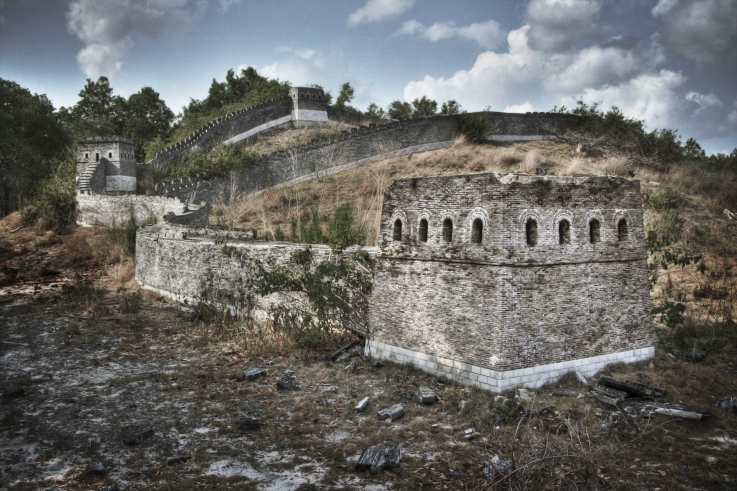 Chang’s photographs document the ruins. I have a long-standing interest in ruined buildings, particularly as they appear in the context of a modern city, so I was intrigued by these photos even without knowing the full context. I think it would actually be interesting to visit this park in its current state. [Thomas Chang. Great Wall. Splendid China Theme Park, Orlando, Florida. Other photograph sets explored the concept of “Chinese identity” as well as the intersection with American identity. Whitespace by David Yun presents portraits of an extended Chinese-American family (presumably taken around Christmas time). There are individuals we conventionally think of as “Asian”, a young blonde girl, and others who look vaguely Latino or Mediteranean, yet these are all blood relatives in the same family. I can certainly identify with a family whose composition defies traditional expectations, with relatives who appear to be from different parts of the world. Yet both my own family and the family presented in Whitespace are quintessentially American, i.e., this is what many American families look like when you get everyone together. Another take on family is presented in Sean Marc Lee’s portraits of his father. We see the typical “American Dad” in the Los Angeles area. But we also a man who seemed to have an exceptionally fun and playful attitude towards life even while raising children; and someone who knew how to “ham it up” for the camera. We see him blowing out candles with his children, posing like a TV still in a 1970s leisure suit in front of a sports car, going for a swim in a mountain lake. We also see him later in life, aging, resting, and receiving medical treatment. There are similarly familiar and intimate portraits of Lee’s father on his flickr site. Kenneth Lo combines commentary on Asian identity in the United States with a lifelong dream to be a basketball star, in one of the shows more entertaining pieces Happy Feet Lucky Shoes. This conceptual work centers around a new brand of athletic shoes marketed as the AZN INVZN (i.e., the “Asian Invasion”) with their own superstar “K Lo.” There was a commercial, in which a young man is getting crushed on a basketball court. But once he receives the “magic touch” from K Lo along with a pair of “Yellow Fever” shoes, he magically acquires unstoppable basketball prowess (along with straight black hair), overpowering his opponents and winning the admiration of attractive cheongsam-clad young women. In addition to the video, and themed t-shirts for sale, the piece also included a Chinatown storefront made into a shoe store that specialized in the AZN INVZN, and even actual reviews on Yelp. Charlene Tan’s The Good Life incorporating “wrappings” of a very different sort. The piece was entirely made of photocopied fast-food wrappers from various locations in Asia. Several were clearly recognizable as McDonald’s wrappers, but for unfamiliar items. There was one that caught my in particular. It featured an Asian cartoon cat making the universal facial expression for “yummy!” surrounded by fish, and was presumably a wrapper for a fish sandwich or snack. I wish I could find a picture of that wrapper somewhere online. 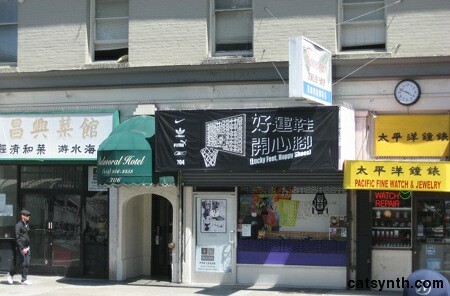 We close with another of the neighborhood storefronts, a text-based work by Tucker Nichols in the Chinese for Affirmative Action window, declaring “YES WE ARE”, a riff of Barack Obama’s “Yes we can!” slogan. It faces inward, as if for the occupants of the office to affirm themselves while looking out at the world. A special thanks to Ellen Oh, Executive Director of the Kearny Street Workshop and co-curator of the exhibition, for hosting our tour. The Kearny Street Workshop will be hosting their annual APAture festival, showcasing Asian Pacific American art. We at CatSynth look forward to attending at least a few of the events.